A strong wind blew across the grasslands as we huddled together, sheltering between vehicles. It was a quiet moment for a group of 50, a time of silence as all gathered close and waited. We stood at the top of a hill near the Wounded Knee Cemetery and the site where a band of Lakota people were massacred in 1890. We prepared for this time at the Lakota College Historical Center in Kyle where we viewed photos and heard the story of Wounded Knee. The time came to experience the place and feel the emotions. First Peoples Fund President Lori Pourier (Oglala Lakota) introduced Tashina Banks Rama (Oglala Lakota / Ojibwe), daughter of Dennis Banks, to share a piece of the second Wounded Knee story when the American Indian Movement occupied the town in 1973. After tearful stories, Tashina went around to those gathered, offering tobacco for ceremony and was embraced with long hugs by the those in the group. 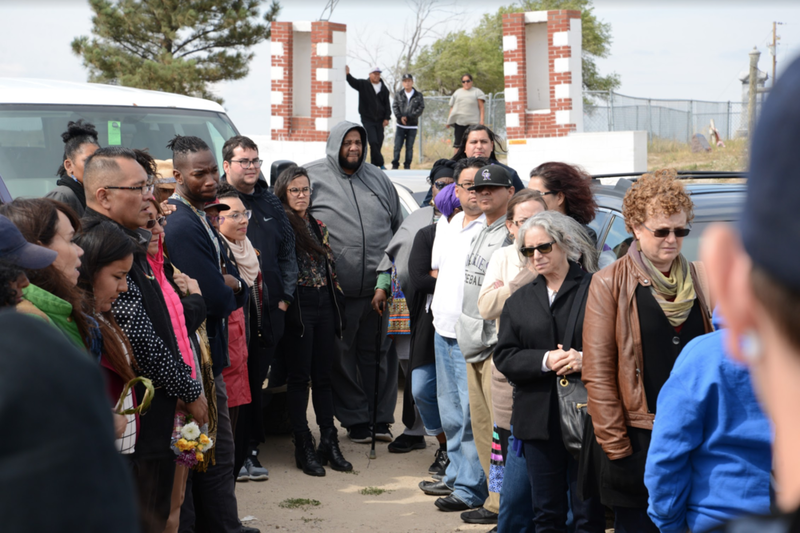 Led with a prayer song by Guss Yellow Hair (Oglala Lakota), who bore the Eagle Staff, the group fell in line to enter the cemetery and pray as we slowly walked around the chain link fence that marked and protected the mass grave. Circling to the front again, Guss opened up the time for anyone to sing or pray. Hawaiians in the group offered chants and wove the braided lauhala leaves they’d brought with them for this purpose they around the top of the fence. “We wanted to bring deep aloha,” said Vicky Holt Takamine (PA’I Foundation Executive Director). American Indians used the hand drum for prayer songs or gave a warrior’s cry. African Americans offered brown sugar. Some people knelt on the earth and prayed for healing. Intercultural Leadership Institute (ILI) fellow Angie Durrell played “Closer to my God” on violin. Across the cultures, we felt the pain of the past and connection with that place. This moving time at Wounded Knee came in the middle of the Intercultural Leadership Institute — Lakota Territory, hosted by First Peoples Fund (FPF). The journey had begun a few days before in the Black Hills, HeSapa, sacred ground for the Lakota People. Ron Martinez Looking Elk (Isleta / Taos Pueblos), FPF trainer and board member, organized the opening circle. Carlton Turner, Alternate Roots Executive Director, officially passed ILI to Lori Pourier and FPF from the institute’s previous immersion experience in Jackson, Mississippi in March. The circle continued around with fellows, partners, and guest introductions. People from Hawai’i and California, across to New York and Rhode Island and states in between came to South Dakota where they learned about Lakota people and their homelands. It wasn’t always an easy experience. Emotional, physical and mental drain on the group was brought up by some of the fellows. Leaders of the partner organizations that founded ILI adjusted the schedule and allowed for time to process the traumatic history and the pain of similarities woven through all cultures. The group covered hard topics about the structure of ILI and how to address issues in the future. The partners welcomed input about the previous convening, and fellows voiced concerns and also their appreciation for the collaboration efforts to grow interculturally as leaders and embody the purpose of the institute. ILI aims to develop an innovative, arts-centered, bold demonstration of intercultural collaboration, learning, and leadership development. That was a takeaway for everyone — the commonalities we have and the efforts to reclaim what was taken or lost. It’s complex work. The fellows acknowledged the importance of building solid foundations on common goals. ILI nurtures community, an atmosphere of like minds coming together with their different perspectives yet same thoughts. On the final day, there was an opportunity for everyone’s voice to be heard in the closing circle when facilitator Tufara Waller Muhammad asked everyone to share what was resonating with them in that moment after all they’d experienced during five days of immersion in Lakota Territory. Responses ranged from sincere gratitude to Lori and First Peoples Fund for hosting the journey, to the emotional bonding and support for one another among the fellows. Throughout ILI there were moments of honoring, gifts given to speakers and leaders after sessions. After the final sharing, Lori gifted parfleche boxes made by FPF fellow Mike Marshall (Sicangu Lakota) and filled with sage bundles tucked inside by her daughter. The convening concluded with intercultural leadership at work. Lori asked Angie Durrell to close out the Lakota Territory convening with a tune on her violin. ILI fellow Adam Horowitz planned to stay two extra days and shoot a video with Bryan Parker, FPF Rolling Rez program coordinator, about the importance of acknowledging place. Even the experience of developing this institute, of cultivating spaces, has developed pedagogy through the process of defining intercultural leadership. There is much more to the Lakota Territory story. But the ILI fellows were able to leave with a sense of belonging in the territory and with the people who call it home. We are looking ahead to the next cohort of Intercultural Leadership Institute fellows. Watch for the upcoming application opening. As an interdisciplinary artist, Peter Williams (Yup’ik) strives to express and celebrate the oneness of all things. Under his fashion label Shaman Furs, Peter produces high-end fur garments. He also demonstrates the technique of sewing seal and sea otter fur at museums and universities. Peter is a 2018 First Peoples Fund (FPF) Artist in Business Leadership Fellow and received a 2018 grant from Rasmuson Foundation. He is based in Sitka, Alaska. Founded by Northern Cheyenne sisters Madison and Jordan Craig in 2017, Shy Natives aims to empower women with customized lingerie. Through Instagram, Shy Natives accumulated a loyal support network in Indian Country and beyond, being featured in Bustle, Indigenous Goddess Gang, Coy Culture, 1904, and Tea & Bannock. Madison and Jordan produce meaningful content along with creating undergarments to fit women of all sizes. In 2018, First Peoples Fund (FPF) supported 15 ABL fellows and 10 CC fellows. Becky Monnens, our Story Tracker/Data Analyst, sorted through the extensive data we collected to help us understand the impact of the fellowship on these 25 artists and culture bearers. Combined with our previously published research on the 6 Resources Artists Need to be Successful, Becky was able to identify not only encouraging data but also the beautiful stories of what our fellows accomplished and experienced throughout the year. Elexa Dawson is a founding member of an all-female acoustic roots band, Weda Skirts (formerly The Skirts), who have released and self-distributed two albums of original music written primarily by Elexa. She is a mother, musician, and activist living in Chase County, Kansas, the heart of the Flint Hills. She is an enrolled member of the Citizen Potawatomi Nation and a descendant of the Cherokee Nation with familial ties to the Chickamauga Cherokee. The tallgrass prairie on ancestral Kaw and Osage territory inspires her music and advocacy. Kevin Locke is an internationally-recognized master traditional folk artist, visionary hoop dancer, indigenous Northern Plains flute player/recording artist, cultural ambassador, and an educator. A citizen of the Standing Rock Sioux Tribe, and coming from the ancestral line of Lakota and Anishinabe, he self identifies as a World Citizen. Since 1978, Kevin has traveled to nearly 100 countries to educate, entertain, engage, and empower 1,000,000 people. He currently serves as president of the Patricia Locke Foundation. Delving into the wealth of stunning showcases, engaging sessions, and the in-between spaces where connections are made, artists and staff from the First Peoples Fund (FPF) family took part in two prestigious performing arts conferences – APAP|NYC and NPN - and came away with inspiration, motivation, and friendships.